My neice, Gretchen, graduated from Eagan High School! 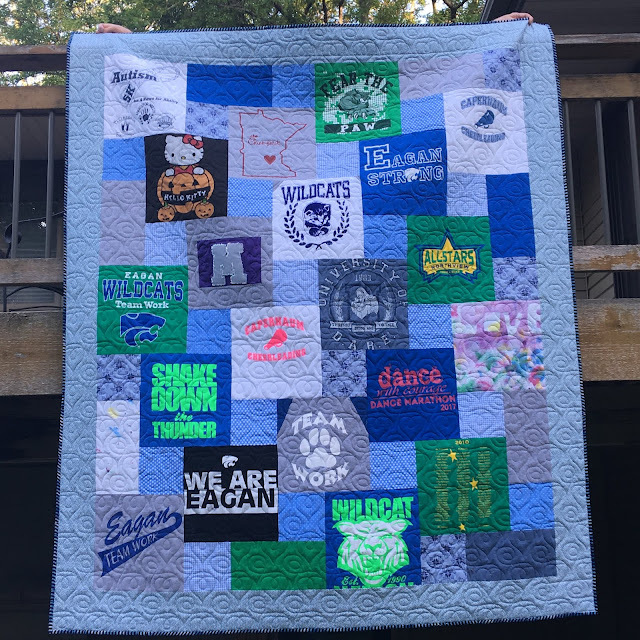 I made her a t-shirt quilt and it was displayed at her graduation party over the weekend. 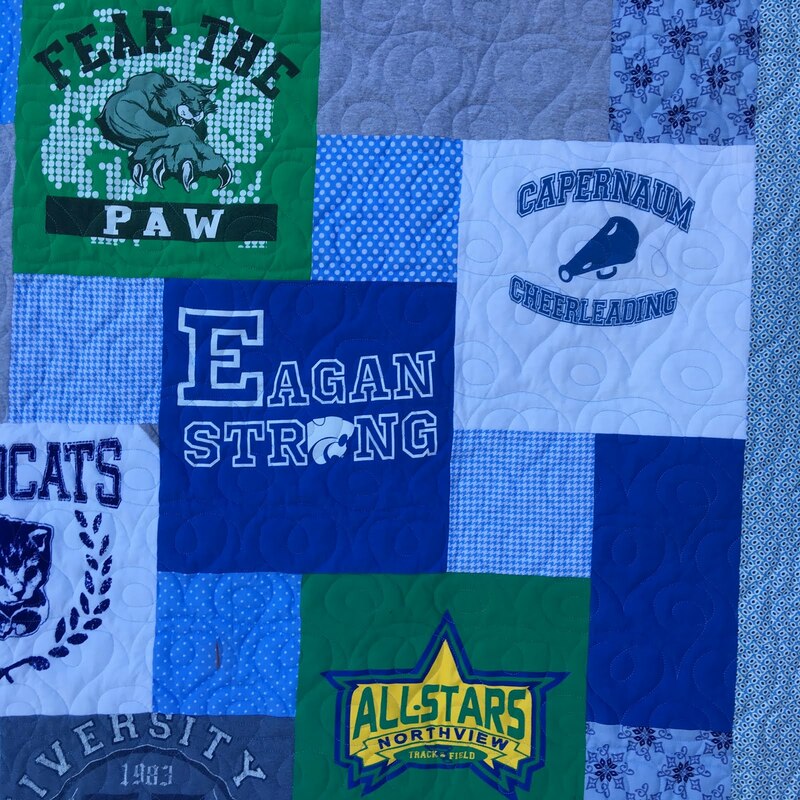 This t-shirt quilt was a total surprise for Gretchen--my sister, Bonnie, went through Gretchen's drawers and thinned out her shirts when Gretchen was at school. Gretchen didn't seem to notice she was missing any shirts, until the big reveal day! Gretchen said her favorite square is the Chick-fil-a square! The "M" is from one of her dance costumes, when her dance group danced to "Hey Mickey". The quilting is "Loopy Over You". Gretchen made the "LOVE" t-shirt in Sunday school class. Backing is an Angela Walters extra-wide backing from Quilt Cove. I did the piecing using the "Step-Down" method, invented by Sarah Fielke. She teaches a Craftsy class on the technique, called "Big Techniques From Small Scraps." It was a super fun celebration. Congrats, Gretchen!!! Linking to Love Laugh Quilt, Quilting is More Fun Than Housework, Confessions of a Fabric Addict. Wow, that is a stunning t-shirt quilt! I love it. The quilting is really nice too! Gretchen loves her new t-shirt quilt! It turned out so cute! 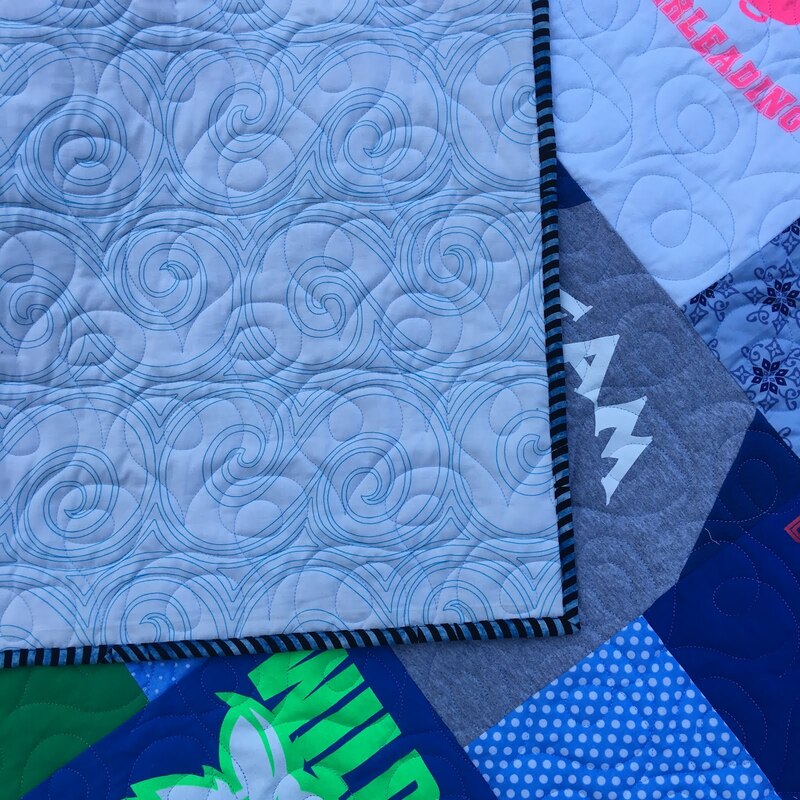 I love how you used her favorite color blue to tie the quilt all together. Thank you! That quilt should be a great memory for Gretchen! It is always fun to surprise someone with a quilt. 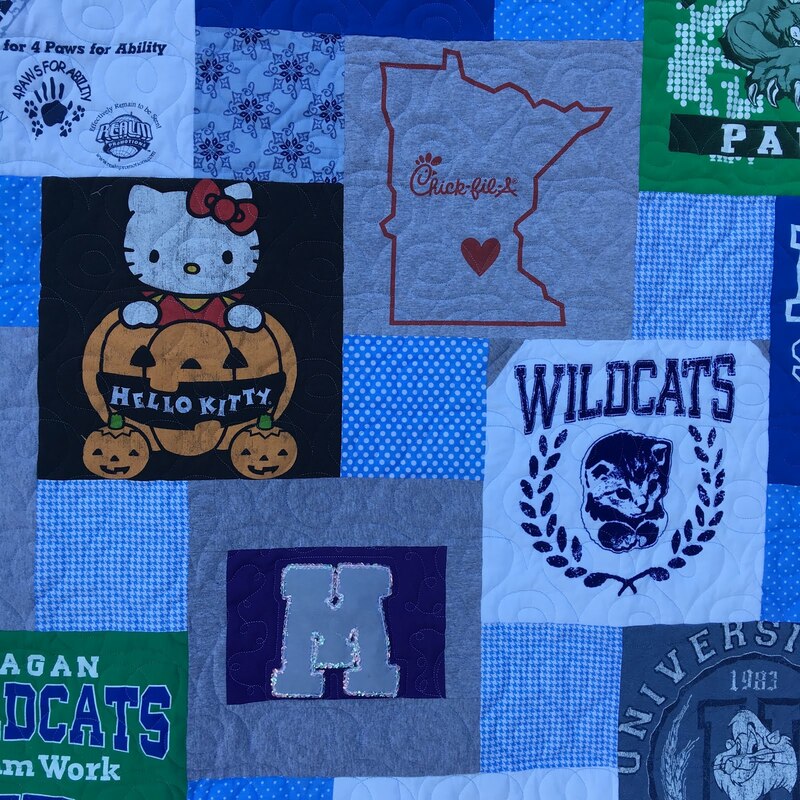 This t shirt quilt is lovely. Thanks for linking up with Oh Scrap! 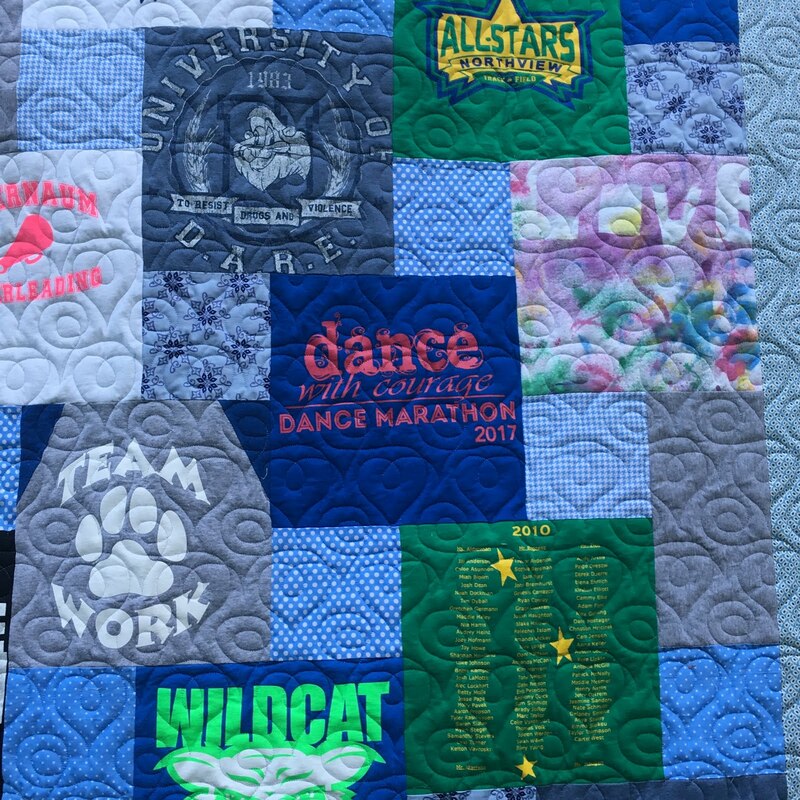 I think this is the nicest T shirt quilt I have seen. I think it may be the step down technique....I'm not sure what that is but I think I can see it in the quilt. What a great technique and a great quilt. This is one of my ufo's for my son, which I think will be two sided. I am definitely checking this out! 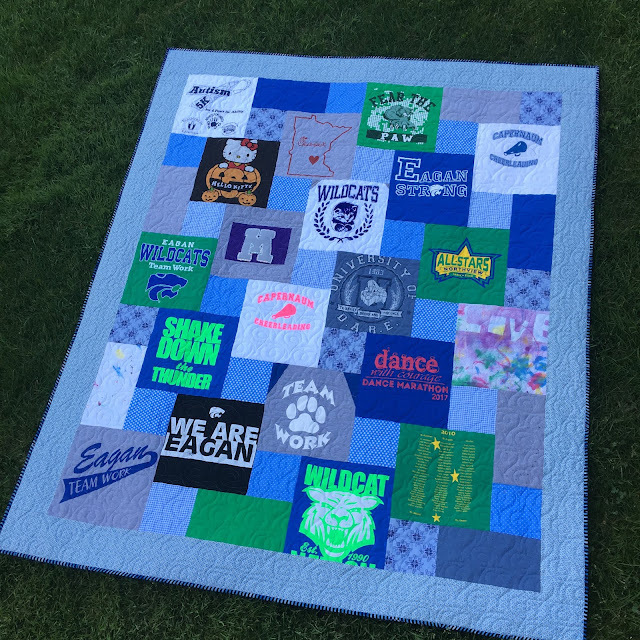 What a fun T shirt quilt-lucky niece! AWESOME quilt!! LOVE that she didn't even notice that her shirts were missing. TOO funny! Too many clothes... like me.